BOSTON, MA--(Marketwired - Oct 6, 2015) - Low oil prices are driving operators toward innovations from robotic drilling to advanced seismic imaging, as they restructure and streamline operations in order to cut down non-productive time (NPT) and shave costs, according to Lux Research. "The new low oil price environment will drive innovation for reducing NPT during drilling operations," said Colleen Kennedy, Lux Research Analyst and lead author of the report titled, "Identifying Ways to Reduce Drilling Budgets in the Low Oil Price Environment." "Contingency costs arising from NPT typically account for about 10% to 15% of total drilling costs, and can rise as high as 30%, so start-ups with technologies that reduce NPT can make for attractive opportunities," she added. Robotic drilling solves key problem. Robotic Drilling Systems enable robotic rigging in land and deep-water operations, reducing human deployment in adverse conditions. The unmanned technology cuts cost by reducing health, safety and environmental incidents, earning the company a "Dominant" position on the Lux Innovation Grid with high technical value and strong business execution. Waveseis leads "High-potential" firms. Firms in the "High-potential" quadrant have strong technical value but lag on business execution. In this category, Waveseis is poised to be a long-term winner with its advanced seismic imaging for subsalt structures which can improve well planning and aid in mitigating drilling hazards. Skynet, Matrix, Tesla are long shots. 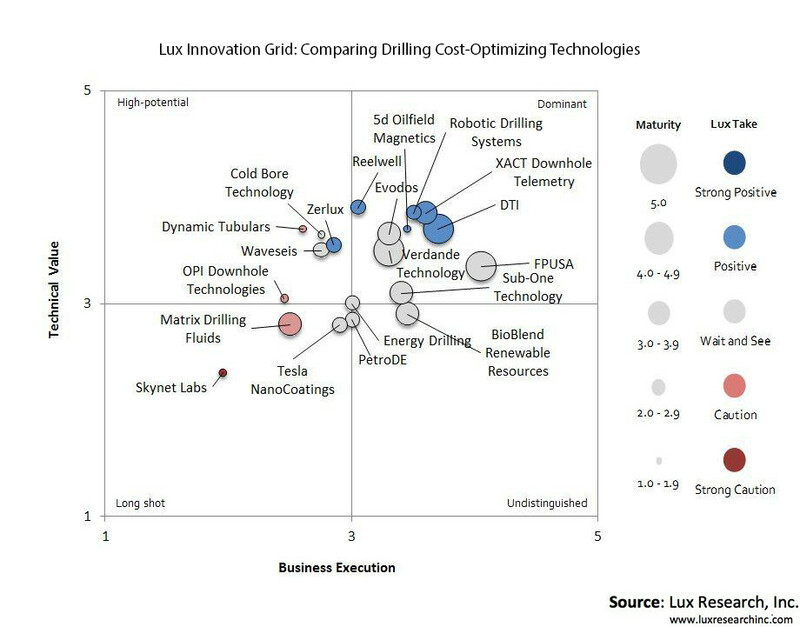 Three diverse companies landed in the "Long shot" quadrant with low technical value and weak business execution: Skynet Labs, Matrix Drilling Fluids and Tesla NanoCoating. Skynet develops mobile apps for calculating drilling parameters; Matrix sells specialty chemicals for drilling and completions; and Tesla creates non-corrosion coatings. 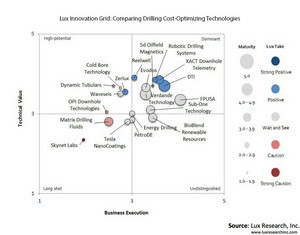 The report, titled "Identifying Ways to Reduce Drilling Budgets in the Low Oil Price Environment," is part of the Lux Research Exploration and Production Intelligence service.